UNITED NATIONS, September 29, updated -- In the run up to a Syria resolution meeting of Security Council Permanent Representatives Thursday at 4 pm, France's Gerard Araud predicted a vote on Friday or Monday, saying "We've waited too long." Russia, meanwhile, indicated Thursday morning that it was not ready to vote. Then on his way into the Council at 4 pm Vitaly Churkin of Russia was asked about the chance of passing the resolution. He said he was "not optimistics," that concerns had not been addressed. Even others supporting the resolution questioned a vote on the last day of the Council Presidency of Lebanon, which blocked a press statement and disassociated itself from the Presidential Statement on Syria. A Deputy Permanent Representative asked Inner City Press rhetorically, "Why not wait until Nigeria takes over?" Sources described further changes to the draft, including extending the time for considering adopting sanctions to 30 days from 15 (and in that earlier draft, reference to adopting, not considering adoption) and changing vigilance over weapons from Syrian authorities to Syria generally, including the opposition. There is also talk of urging the opposition to be vigilant about extremism, and the freedom of religion issue still bouncing around. So is the Council ready to vote on Friday, or even Thursday as one Permanent Representative suggested? Watch this site. UNITED NATIONS, September 28 -- As the European members of the UN Security Council on Wednesday said they were getting Russia and others on board with their resolution on Syria, another Council member told Inner City Press that the disagreements go beyond including or not including a paragraph threatening sanctions in 15 days. "There's also the International Criminal Court," the source told Inner City Press, "freedom of religion and how to encourage the opposition to negotiate with the government." The Europeans were to circulate a new draft on Wednesday night, for consultations at the expert level on Thursday afternoon. 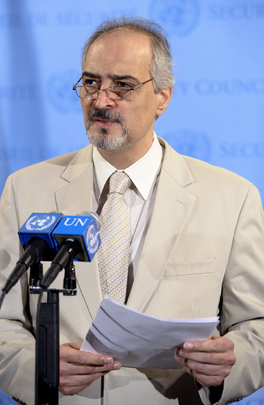 Inner City Press asked Syrian Ambassador Bashar Ja'afari about his foreign minister's meeting with Ban Ki-moon, and about the position of Turkey. Of the Ban meeting, Ja'afari told Inner City Press, "the meeting was good, it was fruitful - tense but fruitful, like everything in diplomacy." Of Turkey, Ja'afari told Inner City Press, "They have their own agenda, we have our own. The gap is getting distant between the two agendas." Given the dust up in which the Turkish security of prime minister Erdogan beat up UN Security, some found irony in Syria's Ambassador praising Ban and criticizing the Turks. But so it goes at the UN.